Fabber is a tool for fitting timeseries data to a forward model using a Bayesian approach. It has been designed for use with fMRI data such as ASL and CEST, however the method is quite general and could be applied to most problems involving fitting discrete data points to a nonlinear model. Bayesian nonlinear model fitting provides a more flexible alternative to traditional linear analysis of perfusion data. In multi-echo or multi-inversion-time data, this approach uses all time points to estimate all the parameters of interest simultaneously. This can be more accurate because it uses a detailed nonlinear model of the pulse sequence, rather than assuming that different parts of the signal are linearly related to each quantity of interest. If you want to process ASL data you should look at the OXASL pipeline which uses Fabber as it’s model fitting tool. Similarly if you have CEST data, the FSL Baycest tool uses Fabber. The FSL Verbena tool uses Fabber to process DSC data. To make this analysis technique fast enough for routine use, we have adapted an approximate method known as Variational Bayes (VB) to work with non-linear forward models. Experimentally we have found that these calculations provide nearly identical results to sampling methods such as MCMC and require only a fraction of the computation time (around a minute per slice). Fabber has a modular design and new nonlinear forward models can be incorporated into the source code. Models have been developed for ASL, CEST, DSC, DCE and dual echo fMRI data. Fabber is distributed as part of FSL, however you should ensure that you are using FSL v6.0.1 as a minimum version. 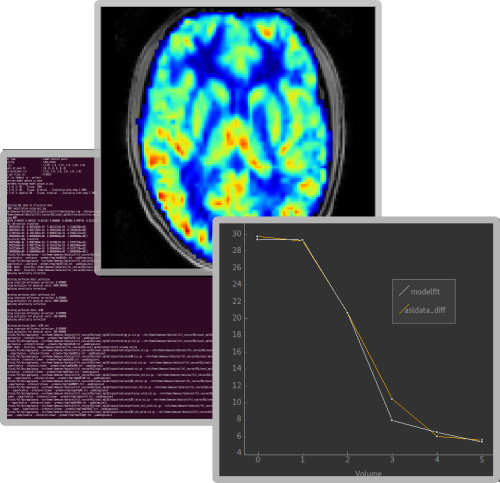 The Quantiphyse visual analysis tool contains plugins to analyse ASL, CEST, DSC and DCE fMRI data using Fabber. If you use fabber in your research, please make sure that you reference at least Chappell et al 2009 , and ideally  and  also. Chappell, M.A., Groves, A.R., Woolrich, M.W., “Variational Bayesian inference for a non-linear forward model”, IEEE Trans. Sig. Proc., 2009, 57(1), 223–236. Woolrich, M., Chiarelli, P., Gallichan, D., Perthen, J., Liu, T. “Bayesian Inference of Haemodynamic Changes in Functional ASL Data”, Magnetic Resonance in Medicine, 56:891-906, 2006. Groves, A. R., Chappell, M. A., & Woolrich, M. W. (2009). “Combined spatial and non-spatial prior for inference on MRI time-series.” NeuroImage, 45(3), 2009.doi:10.1016/j.neuroimage.2008.12.027. © Copyright 2018, Martin Craig Revision 9554f30a.